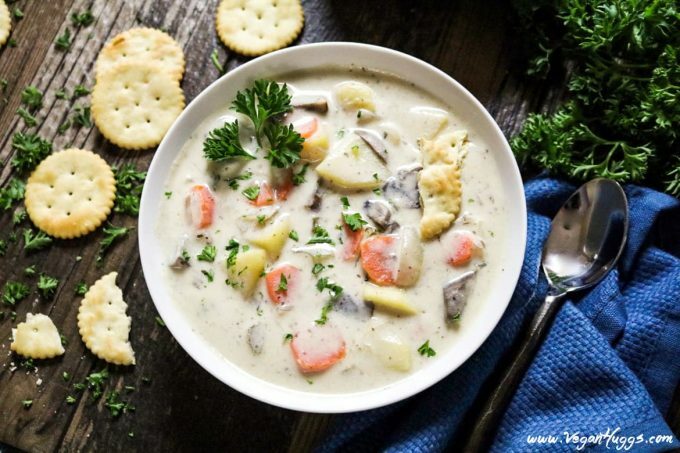 Warm up on a chilly night with this rich, creamy & hearty New England Vegan Clam Chowder. It takes 30 minutes to make & it’s easy to prepare, too. If anyone knows me, they know I’m a big soup fanatic. They are easy to prepare, filling, satisfying, inexpensive, and they’re great make-ahead and freezable meals. Some family favorites in the rotation are my Vegan French Onion Soup, my Creamy Potato Leek Soup, and this New England Vegan Clam Chowder. Vegan Clam Chowder? How is that possible? People may wonder why some vegans want to recreate a recipe that is mostly animal-based. For me, I just like to enjoy flavors and textures that are familiar to me, and there’s nothing else behind it. 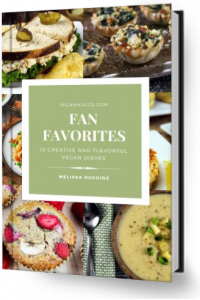 I also feel recipes like this are great for transitioning vegans, and they can change their diet without changing their palate. Besides, most animal-based ingredients taste kind of bland on their own. It’s the veggies, herbs, and spices that bring a recipe to life. Clams have a chewy texture, are salty and sometimes sandy. Yep, I’ve had clam chowder with sand in it, and it’s not appetizing. Imagine just boiling clams in water without any flavoring – not so tasty anymore, right? 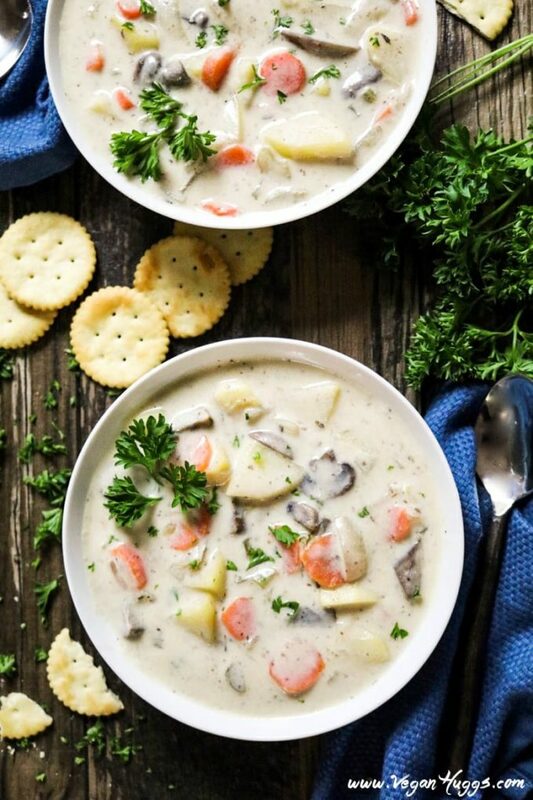 What makes clam chowder appealing is the creamy, buttery texture, the tender veggies, and the warm, comforting feeling you get when you eat it. So why not recreate the clam-like texture, saltiness and subtle sea-like flavor and make a tasty and cruelty-free version? Sounds good to me! Does Vegan Clam Chowder Taste Like The Original? Now I’m not going to say this tastes exactly like clam chowder, but it’s pretty darn close. This vegan version will provide similar textures and flavors of the original, without using dairy or clams. It’s creamy, rich, buttery, hearty and worlds healthier, too. You won’t be missing flavor at all, but you’ll be skipping out on unhealthy fat, antibiotics & other nasty stuff from the dairy. Plus, it will be sans mercury and other contaminants from the clams. With this Vegan Clam Chowder, you can leave your friends in the ocean and cow’s udders alone. What is Vegan Clam Chowder made of? To create the clam-like texture, I sautéed white button mushrooms in vegan butter, garlic and a bit of soy sauce. This will give them a nice depth and a hint of saltiness. Any mushrooms can be used, but I decided to use the most readily available and cheapest. This goes well with oyster mushrooms or shiitake too, but those can be costly. You can also add a blend of your faves. There are no mushroom rules here! Next, I sautéed onions, garlic, celery, carrots, and thyme together. Carrots aren’t traditionally used in the New England version, but they’re in the East Hampton one. I like the pop of color, flavor, and texture they add, so I use them. Feel free to omit them. I’m not sure if this is traditionally used either, but I’ve gotta add some vino when possible. It adds another layer of flavor, plus it’s a great excuse to have a glass while you’re cooking. Check out Barnivore for a vegan wine selection. To thicken the soup, I sprinkle in gluten-free flour, but you can use regular all-purpose flour. Now I add the vegetable broth, potatoes, and sea salt. To give the chowder a subtle sea-like flavor, I use kelp or dulse flakes/granules. Broken up nori sheets can be used too. This ingredient isn’t necessary but will make the flavor more reminiscent of clam chowder. It also provides a natural source of iodine too. For the creamy finish, I blended raw cashews together with unsweetened soy milk. Any milk can be used, I just prefer soy because it has a richer texture. Full-fat coconut milk would be my next choice. Just make sure the milk is unsweetened. Now ladle it into your favorite soup bowls, top with fresh-cut parsley and side with classic saltine crackers or crispy bread. Are you ready to give this a try? Let’s do this! 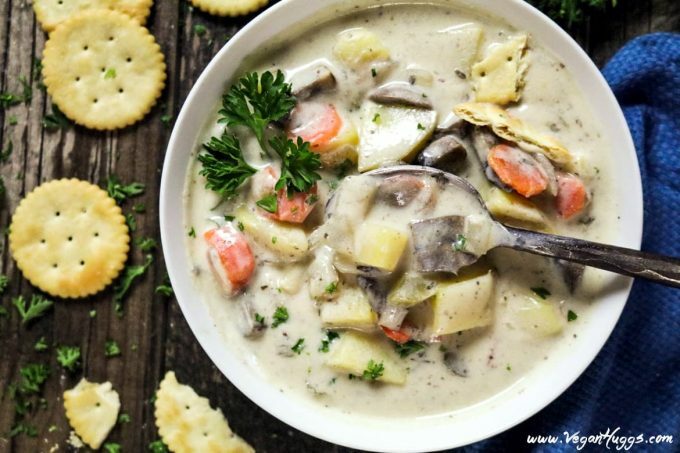 If you make this Vegan Clam Chowder, I’d love to get your feedback. You can leave a comment below and let me know what you think. It would really make my day. You can also follow me on Instagram and share your creation with me. Just tag me @veganhuggs and hashtag #veganhuggs so I don’t miss it. 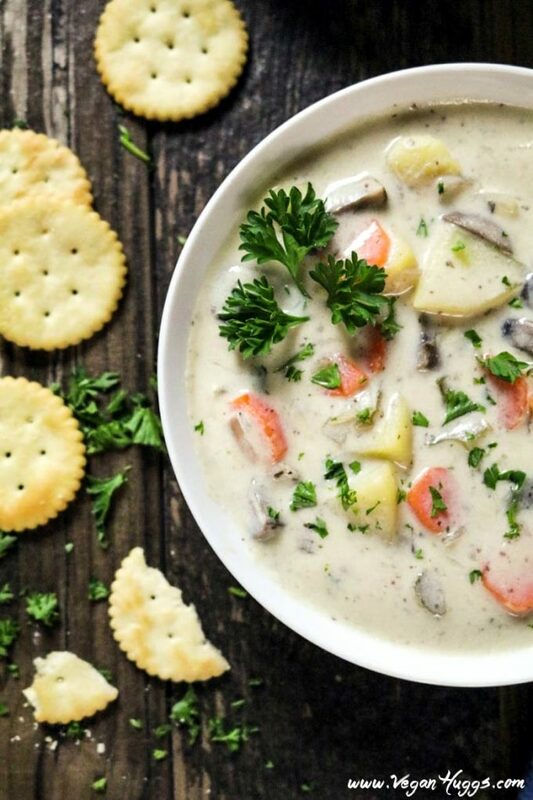 Warm up on a chilly night with this rich, creamy & hearty New England Vegan Clam Chowder. It takes 30 minutes to make & it's easy to prepare, too. Blend the soy milk & cashews (discard soaking water) together until very smooth. Set aside. In a large sauce pot over medium heat, add 1 tablespoon butter. When heated, add mushrooms and sauté until the liquid evaporates (about 3 minutes). Now add 1 clove minced garlic and soy sauce. Sauté until the mushrooms are tender & lightly browned. About 2-4 minutes. Remove mushrooms and set aside. Wipe out the same pot and return to stove. Heat butter over medium heat. Add onion and sauté until translucent, about 2-3 minutes. Add celery, carrots, garlic & thyme. Sauté about 5-7 minutes or until veggies are tender. Add wine and turn heat up to medium-high to simmer. Once simmering turn heat back to medium. Cook wine down about 3-5 minutes. Stir often. Sprinkle flour over veggies and stir constantly for 30-60 seconds. Stir in broth and add potatoes, bay leaf, kelp granules, and salt. Bring to a simmer for about 10-15 minutes, until potatoes are tender. Discard bay leaves. Turn heat to medium low and slowly stir in cashew cream. Taste for seasoning and add more if needed. Cook for 3-4 minutes and remove from heat. Stir in mushrooms, lemon juice and fresh cracked pepper. Place in your favorite soup bowls & garnish with fresh parsley. Side with crackers or crispy bread. Enjoy! *To speed up soaking time for cashews: in a small pot, boil water and remove from heat. Add cashews and cover for 15-20 minutes, until softened. To make this cashew-free, omit the Cream Base Step (soy milk and cashews)and replace it with 1 cup of canned lite coconut milk. Add to soup after removing from heat. * If you can't find kelp granules, you can use dulse flakes, dulse granules or break up a small piece of nori. If you don't want the ocean-like flavor, you can omit the seaweed altogether. It will still be delicious! You can also add a teaspoon of Old Bay Seasoning. This is AMAZING! My whole family is loving it! I’m so happy I doubled it. 😋 Thank you so much for such a wonderful recipe. My husband and I LOVE this recipe! It’s truly delicious. Amazing taste !!! Made it two weeks ago for the first time and making it tonight but dubble batch 🙂 .Thank you for sharing !!! Absolutely amazing is the only 2 words I could use to describe how perfect this was. Thank your for the amazing vegan clam chowder. 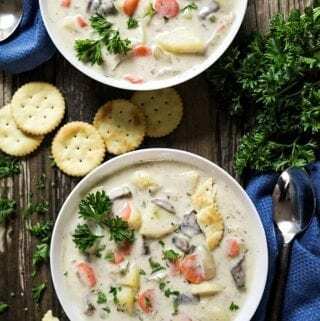 I was never a fan of clam chowder in my omnivore days but this chowder has won me over! I made it as written, then added another cup of broth along w/ some Old Bay Seasoning like you suggested. BLISS! Thank you Melissa! This is a favorite recipe in our home. Whenever we see our local oyster mushroom guy, we know we have to make this. Which is about every other week. Thanks so much for this vegan classic. P.S. Love all your recipes. Keep it up!! I made this and added 1 tsp liquid smoke and omitted the kelp and garnished with cilantro, served with homemade sourdough bread. Your recipe is really outstanding! Thank you! I have made this countless time and I recommend your website and recipe on every plant based eating group I follow. This is a winner, & a crowd pleaser. I have also added corn and sundried tomatoes for more chew. To be super decadent, I have served this over vol au vent pastry shells, with a side salad of boston lettuce with a creamy mustard dressing 🙂 Thank you.